Born in Franklin, Massachusetts, Charles Partridge Adams became one of the famous late 19th and early 20th-century painters of the Rocky Mountains in Colorado. His signature mountain scenes had dramatic stormy skies of brilliant sunlight. In 1876, he and his mother and sister moved to Denver because of his sister's tuberculosis, and he worked for an engraver and studied privately with Helen Chain. Extremely attracted to the scenery, he established a highly successful studio called "The Sketch Box," and advertised "Landscapes and Crayon Portraits." He became a charter member of the Denver Artist's Club. In 1882, when Chain and Adams submitted entries to the Denver Exposition, Adams won the gold medal, which was quite a distinction, not only for him, but for Helen Chain. 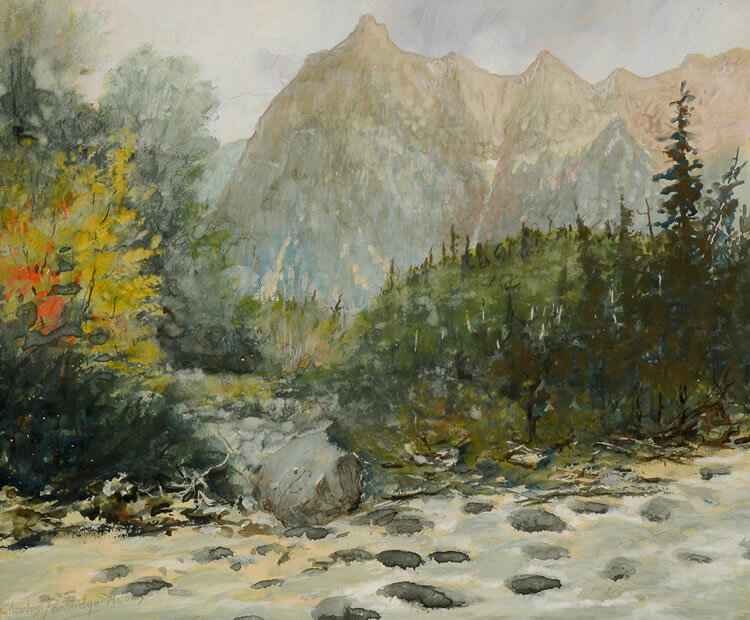 In the summers, he painted at Estes Park with a view of Long's Peak, a landmark he depicted many times. He also traveled south into New Mexico and north into the Tetons and Yellowstone Park and west to the mountains in California. In 1914, he made a tour of Europe. In the early 1920s, he moved to Laguna Beach, California, where he remained until his death in 1942. In this period, he painted marine scenes and views of the Sierra Nevada mountains. During his lifetime, he completed several thousand paintings, but he did not document his paintings so the actual number is unknown. Examples of his work can be found in Colorado at the University of Colorado at Boulder, the Denver Museum, and the Denver Art Association as well as among numerous private collectors. It is also at the San Diego Woman's Club.